Teaming up with VICE, President Obama made a historic visit to El Reno Federal Correction Institution in Oklahoma this week. 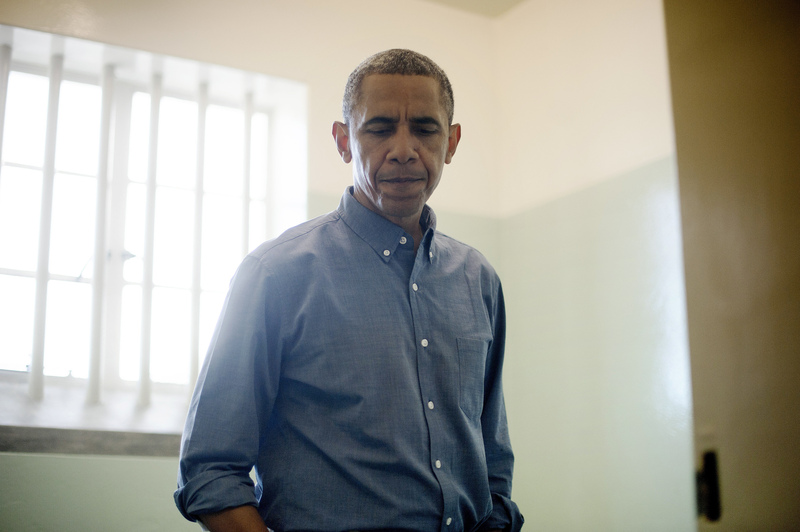 It was a big moment: Obama is the first sitting U.S. president to visit a federal prison. The visit was documented in partnership with VICE for an HBO documentary special that will air this coming fall. This documentary special is highly anticipated — it's seen as a key part of the president's plan for major prison reform. In the last term of his presidency, Obama has been vocal about his desire for reform, even commuting dozens of low-level offenders' sentences last week. While we'll have to be patient and wait until the fall to see the whole documentary, we have a sneak peek of what's to come in the documentary in the form of some quotes from Obama about his trip to the prison. According to CNN, President Obama made a direct connection between his recent moves to create system-wise changes in the prison system to Thursday's El Reno tour. This is part of our effort to highlight both the challenges and opportunities we face with respect to the criminal justice system. My goal is that we start seeing some improvements at the federal level and that we're then able to see states across the country pick up the baton, and there are already some states that leading the way in both sentencing reform as well as prison reform and make sure that we're seeing what works and build off that. The New York Times reported that the president discussed comparisons between decisions he made as a young person to those of some of the inmates at El Reno, noting that there isn't necessarily a huge different between his early life and those of the prisoners. When they describe their youth and their childhood, these are young people who made mistakes that aren’t that different than the mistakes I made. What is normal is teenagers doing stupid things. What is normal is young people making mistakes. Mr. Obama also noted that he wants changes to be made in terms of overcrowding in prisons. Three whole-grown men in a 9-by-10 cell... Overcrowding like that is something that has to be addressed. While the president has recently shortened the prison sentences of some non-violent drug offenders, the New York Times reported that Obama is remaining tough on violent offenders. There are people who need to be in prison, and I don’t have tolerance for violent criminals. CNN reported that Obama made it clear that he has a problem with mass incarceration. Mass incarceration makes our country worse off and we need to do something about it. CNN also reported that the president spoke to the high levels of young people in prison in the U.S. compared to other developed countries; the U.S. has 5 percent of the world's population and nearly 25 percent of the world's prisoners. I think we have a tendency sometimes to almost take for granted or think it's normal that so many young people end up in our criminal justice system. It's not normal. Speaking about the issue of race and criminal justice, Mr. Obama made mention of the fact that men of color are often treated differently by the criminal justice system, according to CNN. In too many places, black boys and black men, and Latino boys and Latino men, experience being treated different under the law. The documentary that will result from this visit will surely reveal more of the president's thoughts on prison reform and on El Reno in particular. The documentary will also include interviews with prisoners and guards at the prison.